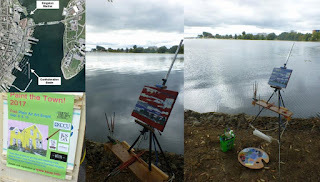 Phil Chadwick's Art: #2015 "The Kingston Marina on the Inner Harbour"
#2015 "The Kingston Marina on the Inner Harbour"
This was the first day of the Paint the Town Kingston in association with the International Plein Air Painters World Wide Paint Out. I went to the point at the southeast corner of the Old Woolen Mill Property. There was still a chilly northwest wind and this location offered some shelter. Duck families paddled by looking for hand-outs. They were used to being fed. After completing #2014 "Morning on the Kingston Causeway" I simply turned my gaze more to the south. This view is toward the Kingston Marina on the Inner Harbour just north of the Lasalle Causeway. Kingston Marina is often confused with the Confederation Basin Marina which is south of the Wolfe Island Ferry docks. From a distance one can only make out jabs of colour and a minimal shape for each of the boats moored to the three main slips on the outer perimeter of the Kingston Marina. Essentially this is another skyscape in disguise as a landscape. The convective clouds were continuing to boil upward. It was only a matter of time before cold air mass showers poured down. The air mass was unstable and the developing towering cumulus were just about to arrive from the northwest. The cold rain would be refreshing but I had some shopping to do so I took a break until after they had passed. I did not get wet but I know some artists got soaked. It is important to keep an eye on the sky as well as the painting.